Bendigo local business GPS Ag, a supporter of the local economy for 15 years and nationally recognized leader in the field of precision farming, unveiled an exciting new world of aerial survey technology at the recent Wimmera Field Day. ‘Scout 2.0’, the GPS Ag entry-level product for aerial surveying tasks went on to win the prestigious Agribusiness Innovation of the Year Award. The Scout comes in a pre-assembled kit that is ready to be flown in a matter of minutes and is equipped with a camera gimbal designed for professional videography. Stable images are guaranteed even in winds up to 25Km/h. Travelling at a speed of up to 20 Km/h and for an estimated 17 minutes per battery charge, the Scout covers approximately 30-40 acres per flight. The Scout kit includes a high-definition GoPro3 camera, providing clear images and video footage. The Managing Director of GPS-Ag, Mr Luke Schelosky said the company was very proud to have won the award. “We can now give the farmer a new perspective on the crop, livestock and farm infrastructure,” he said “This extra operational intelligence is possible for a minimal time and cost investment. 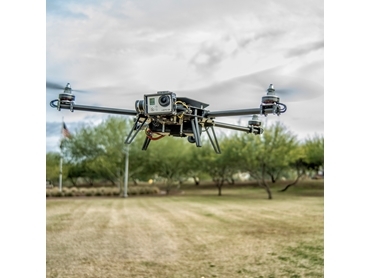 Crop and livestock health, pest and weed monitoring, irrigation efficiency and crop yield predictions are just a few of the benefits that can be gained from aerial surveying. As a result, a farm runs at higher efficiency and becomes immediately more profitable”. He went on to say that while UAVs are the buzzword in the industry the image processing technology and detailed analysis are where the magic happens. GPS Ag’s new equipment includes state of the art camera systems primed to deliver high precision image processing and analysis technologies. Mr Schelosky advised that The Scout is the first UAV in GPS Ag’s line of aerial survey vehicles. It will be closely followed by the ‘Hex 2’, a larger UAV that flies longer and carries more sophisticated camera systems for high-resolution Normalized Difference Vegetation Index (NDVI), near-infrared and thermal imaging. The third vehicle, a fixed wing UAV for the survey of thousands of acres at a time is planned for release in the second quarter of 2014. Aerial survey gives farmers the opportunity to gather new information about their farm and provides the data to assist with critical decision making. The award winning breakthrough in UAV technology we saw on display at the Wimmera Field Day showed the future possibilities and pointed to potential beyond our imagination.